The Trump administration is seeking to give the Defense Department as much money as Congress can appropriate for fiscal year 2019 to fund the Pentagon’s newest strategy and to fulfill President Donald Trump’s repeated promise to rebuild the military. The Pentagon request released Monday claims to align with the Pentagon’s recently released National Defense Strategy, which elevates the possibility of great power conflict with Russia and China as the country’s greatest security concern, eclipsing terrorism. The request sets aside $716 billion for national defense programs, including $617 billion in base Pentagon spending and $69 billion for overseas contingency, or war, accounts, totaling $686 billion for the Defense Department. The remaining $30 billion of the total is allocated for Department of Energy nuclear programs and a few other accounts. The $686 billion Defense Department topline represents an $80 billion, or 13 percent, increase from the 2017 enacted defense spending level. The request aligns perfectly with a two-year budget deal that Congress struck and the president signed last week that clears the way for the $716 billion for national defense spending. The budget deal raised defense caps by $80 billion in fiscal 2018 and $85 billion in fiscal 2019. With these increases, defense spending caps are set at $629 billion for fiscal 2018 and $647 billion for fiscal 2019. When combined with overseas contingency, or war, accounts that aren’t subject to spending caps, total discretionary spending for the Pentagon will rise to $700 billion this year and $716 billion next year. The deal also made it possible for the administration to submit a smaller fiscal 2019 Overseas Contingency Operations (OCO) request. 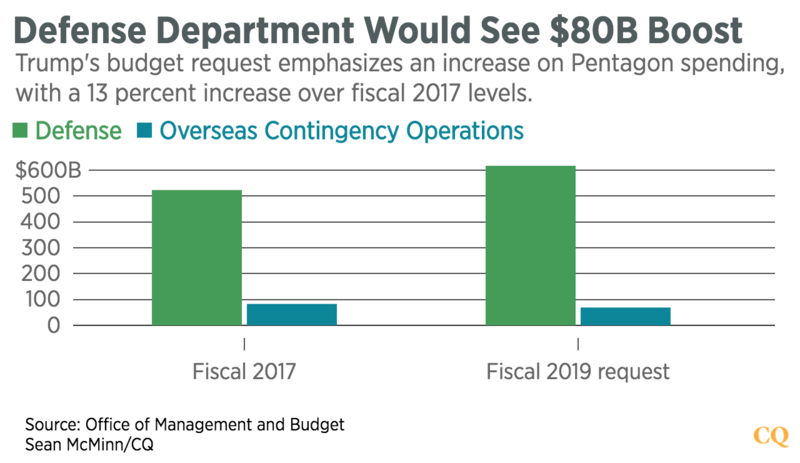 Prior to the caps deal, the administration had planned to submit an $89 billion OCO request. But upon raising spending caps to the Pentagon’s desired levels, the White House shifted $20 billion from the OCO request to the base request. The uncapped war account has long been used to fund routine programs that have not made the cut for the base budget. The Pentagon plans to use its billions to acquire more planes, ships, missiles and high-tech capabilities designed to give the U.S. an advantage in a great power conflict. The fiscal 2019 request asks for 77 F-35 Joint Strike Fighters at the cost of $10.7 billion, compared to the fiscal 2018 request for 70 F-35 jets. The 2019 request also asks for $2 billion for an additional 24 F/A-18E/F Super Hornets for the Navy, compared to the fiscal 2018 request for 20 of the jets. The Pentagon intends to buy 10 new ships with fiscal 2019 funds. The department plans to spend $6 billion to procure three DDG-51 Arleigh Burke Class Destroyers, $7.4 billion for two Virginia Class Submarines, $1.3 billion for one Littoral Combat Ship, and $1.8 billion as a payment for a previously acquired CVN-78 Class Aircraft Carrier. A key aspect of winning a war against another military power would be defeating the enemy’s anti-access and area denial, or A2/AD, capability. The budget request asks for 43,594 Joint Direct Attack Munitions at a cost of $1.2 billion and another $1.2 billion for 9,733 Guided Multiple Launch Rocket Systems used by the Army and Marine Corps. The Pentagon also plans to spend $13.7 billion on high-tech capabilities, though the request doesn’t lay out in detail how the Pentagon plans to allocate such funds. New hypersonic, autonomous, space, directed energy, electronic warfare, artificial intelligence and cyber programs are wrapped into that tranche of funding. Defense Department Comptroller David L. Norquist identified that cyber functions would receive $8.6 billion. The budget also looks to boost personnel levels. By fiscal year 2019, the Pentagon hopes to have 2,155,800 active and reserve troops, 25,900 more than the planned levels for fiscal year 2018. The war in Afghanistan would receive the lion’s share of OCO funding in fiscal year 2019. The Pentagon plans to spend $46.3 billion for the 16-year old conflict, the longest in U.S. history. Of the total, $5.2 billion is slated to be spent to train and equip the Afghan security forces, including support for the Afghan Air Force. The ongoing conflict in Iraq and Syria would receive $15.3 billion, with $1.4 of the total allotted to train and equip Iraqi Security Forces and vetted Syrian opposition forces. The OCO request also calls for $6.5 billion for the European Defense Initiative, which includes $200 million for Ukraine to “build capacity to conduct internal defense operations to defend its sovereignty and territorial integrity,” a clear signal to Moscow that the U.S. stands with Kiev in its fight against separatists backed by Russia in eastern Ukraine.